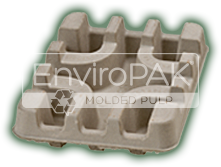 Our team’s collective knowledge of the paper and packaging industry together with the experience of our world-class design team gives EnviroPAK a distinct advantage when comparing molded pulp packaging solutions and the companies that manufacture or import them. If you can dream it, we can design it – is a philosophy we start with when creating CAD designs that quickly lead to working prototypes. Our locations in the Central U.S. gives us the unique ability to ship economically to all points within the USA, as well as Canada and Mexico. Contact us to see your dream come to life inside our software or even directly in your hands.